Barbs back and hotter than a fistful of napalm! 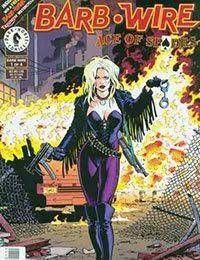 Hard on the heels of the smash film starring Baywatch bombshell Pamela Anderson, Barb Wire rocks your world with new adventures of Steel Harbors baddest bounty-hunting beauty. Someone is gunning down gangsters with lethal impunity in Metal City, threatening to light the fuse to another apocalyptic street war. The killer is a mysterious woman named Death Card shes a drop-dead knockout whos good with guns and has a fondness for powerful motorcycles. Sound like anyone we know?